How does the training system operate? How to setup a SCATT MX-02 system? How to update my old SCATT USB system for compatibility with newest computers and Windows versions? At trainings in prone position, the average point of hits floats. How does the SCATT training system determine the moment when the shot has been fired? Can training without recoil and shot sound possibly harm a shooter? Can one achieve high results, using only SCATT training and without live-firing? Where can I use SCATT? How can I move my shooting files from the SCATT Solution program into the SCATT Professional folder? Why is a shot sometimes depicted separately from the trajectory? How much time do I need to connect the training system to my PC in order to start training? Where I can see the SCATT files of famous shooters? Can I connect my old model of SCATT system to a PC, using the USB port? Can several shooters train, using the same computer? What should I do if the device’s CODE is lost? Can I use the training system with a model weapon? Can the optical sensor change the balance of my weapon? The basis of the SCATT training systems is the principle of determining a position with the help of infra-red light, which is placed inside the case of the electronic target, and the receiver of the infra-red light, fixed to the weapon itself. The data from the receiver (sensor) goes to the trainer’s base unit, which in turn transforms it for the further transmission into a PC. Inside the PC, the data is processed through the SCATT program, which displays it in the form of aiming trajectory and the position of the holes in the target. It may can occur from the signal, reflected by floor. To reduce that influence just put on the floor a piece of carpet or rag in the middle of the shooting line. 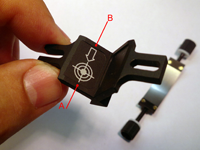 Inside the optical sensor, which is fixed on the weapon’s barrel, there is a miniature microphone; it registers the click of the trigger or release of the arrow. The sensitivity of the sensor can be set in the program. Training on a dry-fire basis cannot do any harm to the shooter. After 2-3 months of such training for many sportsmen, just 2-3 training periods with live-firing will be enough to get used to the recoil of the weapon. high-level shooters to train with the SCATT system for approximately 70-80% of overall training time in the basic training period and 30-50% during the competition period. There was a case of a sportsman who was using the training system only (dry-fire) for three months before a forthcoming Championship of Russia. He then only had 5 training periods with live-firing and subsequently won the gold medal, with a new Russian record. beginners train only with the SCATT training system. The later a beginner starts to live-fire, the better. A weapon’s recoil and shot sound simply make the overall training process two to three times slower. those shooters who do not like training systems, can use this trainer just for diagnosing mistakes and to search for new shooting positions. No. From time to time it is necessary to have live-fire training, especially with small- and large-caliber weapons, since the shooting accuracy is greatly influenced by the ready position and grouping of shots. Also remember if one wants to learn to shoot in wind and various light conditions, this can only be done on the shooting ground. SCATT systems can be set up with a 2.5 to 1000 metre depend of the SCATT model, in any place where the system can be connected to a computer, i.e. in a shooting club, in the office, at home or in the garage. The only ‘but’ – do not set it up in a wet environment! Whilst installing the SCATT Professional program you gave the name of the folder for storage of shooting files (by default “C: SCATT CATALOG”). Move shooting files from the folder “C:WINSCATT” into folder “C:SCATT CATALOG” (do not confuse with “My ComputerSCATT CATALOG” – virtual folder, emulated by SCATT program). Shooting files will then appear in the SCATT Professional folder. Example: To hit the target, a bomber drops a bomb not precisely above the target, but a little bit earlier, as the bomb leaving the plane, has the same speed as the plane and continues moving in the same direction until it hits the ground. SCATT Program applies the same algorithm, allowing it to make a very accurate fix of the point of impact. For example, the bullet, having left the barrel, continues moving in the same direction as the barrel of the weapon before the shot. That is why, if a shooter is not steady enough, a shot can be separated from the trajectory. So try and optimize your performance, corresponding to the distance and bullet speed. First time it will take you about 10 minutes to connect the trainer to the computer and install the program. Preparation for subsequent training sessions will take about 3 minutes. It can be done through USB <=> RS-232 (COM) adapter. Unfortunately not all drivers of the adapters are compatible with the training system. Be sure that the check box “enable legacy (RS-232) devices” in “Options” menu of SCATT program is activated. Yes. Two shooters can connect two training systems to the same computer. For this purpose, two trainers are connected to one PC, and SCATT program is then downloaded twice. Connecting more then two training systems is not worthwhile, as it is not comfortable to use the same mouse, keyboard and display. Code and serial number are printed on the warranty card. If you lose the warranty card, contact us and give the serial number of your training system. We will immediately tell you the code. Yes, provided it is possible to fix an optical sensor and the model has a trigger mechanism. While training with rifles, the weapon’s balance hardly changes. Whilst practicing with pneumatic pistols, it is recommended to use an empty compressed air cylinder to fix the optical sensor to. The SCATT files can be download from this directory. In the process of calibrating the optical sensor, aiming point and shothole does not enter into the workarea. At the core of the problem may have two reasons. 2- Optical sensor mounted not coaxially with the barrel. Side “A” is lower than side “B”, is made to compensate for the difference in elevation between the sights of weapons and an optical sensor. That the axis of sighting arms converge with the optical axis of the sensor in the electronic target. This scheme works only when the optical sensor mounted under the barrel of weapons. 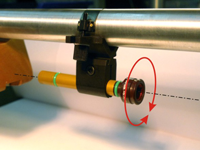 If an optical sensor mounted to the side of the trunk, or the barrel has a conical shape, may need to install pad (“C”) under rim of mounting prism. 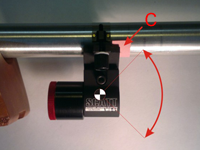 By varying the position and thickness of the pad, necessary to ensure that the optical sensor aiming point fell into the workarea of the optical sensor calibration window. If you use optical sensor WS-M01 model, you can spin it inside the barrel, or clamp (depending kind of mounting) to slightly shift the aiming point. You also can use mounting prism with adjusting to eliminate parallax. How to update my old SCATT USB system for compatibility with newest computers and Windows versions? You can update firmware of your SCATT devices by this application. For the update better to use a computer running Windows 7 with USB 2.0 ports. You shall update one device at a time (first connect and update the optical sensor, then disconnect optical sensor and connect the target control box. After completing target control unit update, disconnect it from the PC, connect the target frame to the target control unit and connect to the PC and run update once again for update the target). After updating your SCATT devices, please use the latest SCATT software and drivers from the "Downloads" section of the our website.